I understand how hard it is for you to wait; therefore, I ask you to begin this day waiting in My presence with praise. You’re too anxious for certain things to happen. You long for Me to move more quickly and to answer your prayers immediately. However, I ask you to be patient and let patience do a perfect work in your life. Praising Me will help quiet the apprehension you feel and will bless you as you wait. When you feel irritated and annoyed because things are not moving fast enough for you, take time to praise Me. Be still in My presence, and wait patiently for Me to act. I am fully aware of your longings and desires. Praise Me for My timing in each of those circumstances; for My timing is perfect. You will be blessed if you wait, so don’t be tempted to take matters into your own hands. My ways are not your ways. One day is with the Lord as a thousand years and a thousand years as one day. I am not slack concerning My promises, and I will move on your behalf at precisely the right moment in time. Thank Me that I am using this time to shape and change you. Often the longer you wait for something, the more deeply you appreciate it. Declare your trust in My timing. Wait for Me and praise Me for the work that I am doing on your behalf. Be strong in the Lord and wait. Choose to believe that I am on time in your life, as you exalt Me, I will strengthen you to wait with grace. Delight yourself in Me as you wait, and you will receive the desires of your heart. Don’t be anxious about anything; pray and wait. 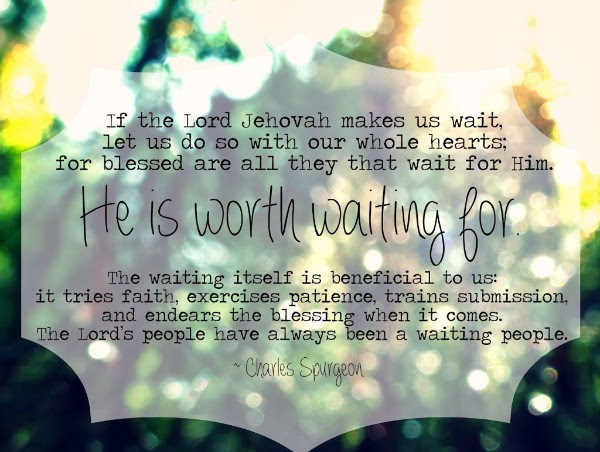 Blessed are those who wait on the Lord. Isa. 30:18 And therefore will the LORD wait, that he may be gracious unto you, and therefore will he be exalted, that he may have mercy upon you: for the LORD is a God of judgment: blessed are all they that wait for him. Isa. 40:31 But they that wait upon the LORD shall renew their strength; they shall mount up with wings as eagles; they shall run, and not be weary and they shall walk, and not faint. Lam. 3:25 The LORD is good unto them that wait for him, to the soul that seeketh him. Php. 4:6 Do not be anxious about anything, but in everything by prayer and supplication with thanksgiving let your requests be made known to God. 2Pe 3:8-9 But, beloved, be not ignorant of this one thing, that one day is with the Lord as a thousand years and a thousand years as one day. The Lord is not slack concerning his promise, as some men count slackness; but is longsuffering to us-ward, not willing that any should perish, but that all should come to repentance. Jas 1:3-4 Knowing this, that the trying of your faith worketh patience. But let patience have her perfect work, that ye may be perfect and entire, wanting nothing.